A FACE ONLY HIS MAMA COULD LOVE!!! MY REFLECTIONS ON MY LOVE OF ANIMALS….! Teed, left, celebrates with Gus after her pooch was crowned champ. Next to her is Dane Andrew and former winner Rascal, another Chinese Crested. Owners of ugly dogs from all over the country traveled to compete in the contest. I had two of these Cresteds in my house when I was growing up. My mother loved to help animals! Our house became a haven rest stop…kind of like the UNDERGROUND RAILROAD for dogs and cats in between adoptive homes! My mother’s friend Joyce had Yorkies that she breed. Sometimes she would come across a breeding dog that no one wanted anymore. My mother would take the dog in until an ad was placed in the local news paper and a adoptive home was found. For some reason we ended up with the two Chinese Cresteds!!! They were so funny and so full of energy. I hated to give them up! But I already had 3 dogs at the time. My mother had a very large bungalo in Springfield Gardens Queens back then We had the largest yard on the block. We had an above ground swimming pool also. I loved my childhood for those reasons. I had my own playground and adventure land. Our yard had a large apple tree, and rose bushes all around. I really, really remember the joys of summer back then. I digress… any how, the Chinese Cresteds would come when I called them. I used to call them THING 1 AND THING 2 or combination of “THE NAKEDS!!! !” I would say, “NAKEDS….COME GET YOUR FOOD!!!! !” And you know what they would do? They would come running and slide into the kitchen in such excitement I would just laugh and laugh! They were adorable! I kind of feel sorry for these Chinese Cresteds displayed in this AOL article because they are sick and then being called ugly. I mean naturally ugly is one thing…but a dog missing a leg, and one eye and having skin cancer is not ugly…the dog is sick. Those dogs in perfect health, look odd…but not ugly. The Cresteds that we had were strong and healthy. They had the tuft of hair on the head, ears, tail, and privates…but they were cute! They were not missing any teeth, they were quite young as a matter of fact. So again, I feel that the dogs they are showing as a competition means, well, that they have to get old and sick before they can compete in this UGLY DOG COMPETITION. I liked their skin, one Crested looked like an pink complexion and their other had brown complexion. I thought they were like people….they were hilarious…and good spirited! They loved tons, and tons of affection! They should do a competition on the world’s best looking Crested! You know…it would be better than seeing these dogs at their worst state….sickly and lacking legs and eyes. Who would want people to see them in ill health and have a picture taken at their worst? Charles Darwin Theories..UPDATE FOR MAY 15, 2008—POLAR BEAR HAS BEEN ADDED TO ENDANGERED SPECIES LIST…BREAKING NEWS FROM 1010 WINS ON 5/14/08!!! !..extinct animals return to grace us with their beauty! Now lets start working on saving our world for them and our children’s children! I am writing this as an update to this article. My heart is hurting for the POLAR BEAR! It is a beautiful animal. But its natural habit is being destroyed by GLOBAL WARMING!!!!! 1010 WINS radio stated it today. That our nation… added it. I feel dismay and fear for our world and its future. AS I WATCHED MY NEW FAVORITE MOVIE….EVAN ALMIGHTY…..I WONDERED…..WHO WILL BUILD THE ARK FOR OUR ENDANGERED SPECIES?????? WHO WILL SAVE THE POLAR BEAR???? WHEN THE TOP AND BOTTOM OF THE WORLD BECOME TOO WARM AND THERE ARE NO MORE ICECAPS….WHO WILL SAVE US????? Think about it and start talking and start writing to your congressman…..PLEASE! OUr world depends on it….your future, and my future, and the CIRCLE OF LIFE depends on it!!!! I love to blog about our natural resources and our animals that are part of our existence. Even if you live in a high rise apartment building do you realize that our planet is governed by certain scientific rules that keep our living enviornment a living enviornment? We need the rain forests, and regular forests to get rid of carbon. The less trees, and vegetation the less oxygen for us all. Green cars, hybrids are part of the solution. HOwever, the constant dregding of the ocean floor and the constant oil spills in the ocean from the barges that carry the exumed oil are killing the ocean animals and birds. Look at these great pictures taken from Black Voices AOL TITLED RARE ANIMAL SIGHTINGS….and think of what you can do. Even if you live in a concrete jungle….think what role you can play to save the green tree jungle for future generations of animals and humanbeings. This cloud rat, found in a mossy forest about 7,700 feet above sea level in Mt. Pulag National Park in the Philippines, was the first of its species to be seen in 112 years. Click through the photos to see sightings of other rare creatures. Researchers from the Cleveland Metroparks Zoo said April 16 they have discovered a rare giant turtle in northern Vietnam. Swinhoe’s soft-shell turtle was previously thought to be extinct in the wild. Three other turtles of the species are in captivity, including this one. THIS FROG BREATHES THROUGH ITS SKIN…THIS ALSO IS ANOTHER ANIMAL THOUGHT TO BE EXTINCT. sUCH VARIETY…SUCH UNIQUE QUALITIES….SHOULD BE PERSERVED. A peculiar breed of frog discovered on the island of Borneo seems to have evolved in reverse, scientists reported April 9. Unlike most creatures that developed lungs as they crawled out of the ocean, the lungless Barbourula kalimantanensis breathes through its skin. Guess what? there is such a thing as a wolverine! What can we do to perserve our forests….use less paper? Replant trees…Keeping it green for such animals. Until this picture of a wolverine was taken on Feb. 28 by a motion-and-heat-detecting digital camera in the northern part of the Sierra Nevada range in California, scientists didn’t believe wolverines still existed there. This is a albino killer whale. The ocean dredging is killing our oceans and the animals that are within. The constant over fishing is causing the sea animals to loose their food source. Researchers working near Alaska’s Aleutian Islands on Feb. 23 spotted a white killer whale, which they estimate was 25 to 30 feet long and weighed more than 10,000 pounds. This is only the third time in the past 15 years that such a whale has been seen in the area. This Maud Island frog lives at the Karori Wildlife Sanctuary in New Zealand. The rare breed, which has changed little over the past 70 million years, is thriving in the predator-free environment. Unlike other frogs, they hatch fully formed, skipping the tadpole stage. They also do not croak, live in water or have webbed feet. This is another animal….so rare that there are only thirty n the world. Our extistence is dependant on the extistence of our animals. In October, wildlife officials caught and examined a critically endangered Amur leopard in order to possibly find out how inbreeding undermines its tiny population in eastern Europe. There are only about 30 such animals left in the wild. This beautiful butterfly so delicate….What can we do to continue to see these rare animals/insects? Visitors flocked to Falcon State Park in Texas after this rare telea hairstreak butterfly was captured on film by Berry Nall in October. The butterfly hadn’t been seen in the U.S. for more than 70 years. In May, scientists discovered these rare soft-shell turtles, once thought to be on the brink of extinction, in a once-restricted part of Cambodia. These animals can live without our basic assistance. All they need from us for us humanbeings to clean up factory emissions, carbon emissions and chemicals that are leaking into the water and ground and stop cutting down the forests. What can we do to save this planet for ourselves and our fellow inhabitants like this owl called….. The long-whiskered owlet, one of the world’s smallest owls, was spotted in the wild for the first time in February 2006. It was seen in a private reserve in Peru. A beautiful large eye looks out from a unique organism. Living unususal and should have the right to live its life. If we empty the ocean…what will happen to the earth? Should we dredge for oil and over fish? Please help keep the earth green for the vegetations and blue for ocean animals and for ourselves. Read, write letters, get involved. Global Warming? Who knows? But cabon emissions, polution are all quite real. So lets. come together as the human race. Does it matter that my skin is brown, yours is white, his/her skin is yellow? Each living thing is beautiful and has the responsibility and right to exist. Look at the Squid above….it is strange, but beautiful. Lets help it to survive….our survival depends on it. ——Survival of the fitest means that the higher the speicies…the more responsible that we have to be to ensure the survival of ALL SPECIES….NOT JUST THE FITEST OR THE STRONGEST….REMEMBER THE CORNY MOVIE….LION KING? 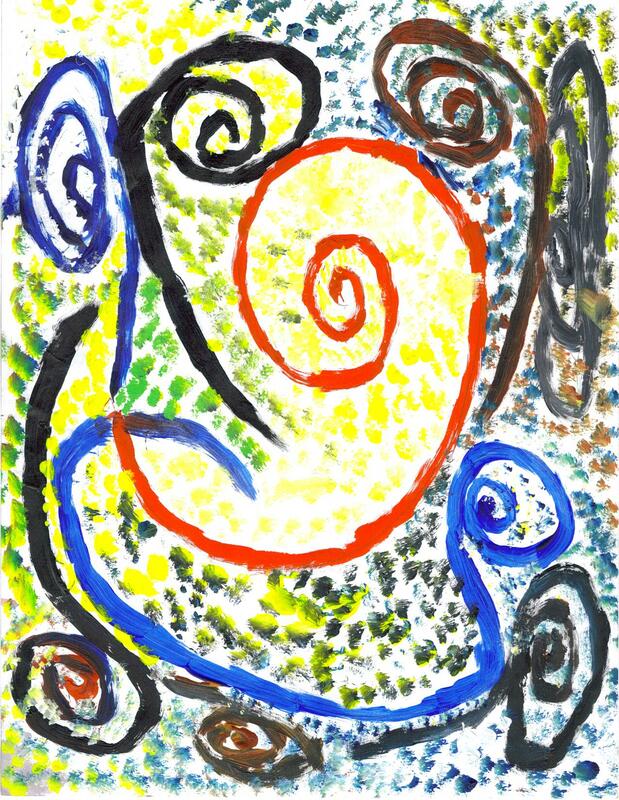 CIRCLE OF LIFE….LETS STAY LINKED AND SURVIVE! My New Year’s Resolution–It’s Gonna Be Great In 2008!!! to improve my status in life! in the lives of men, women, and children? from victories left not won? of every race, creed and religion? and prepared to be GREAT? What say you, my fellowman kind and womankind–Are we up for the challenge to participate in the year 2008! Come forward, and do not fear, the end of the 2007 is drawing to an end. I hope you will take the challenge and assist this beautiful world on which we reside to come to a mend and heal from deep inside. You do not have to believe in the same God as I do. Take another step forward toward your destiny. There is a purpose for all of us on this globe called earth! Do not be afraid to see your value, see your worth! receive joy, peace and prosperity in the coming year 2008! For those who have received much….much is required back to assist those who are yet on the road as pilgrims seeking salvation and peace. the Beginning and the End —give you all that you need to succeed in 2008! I resolve to be a help and not a hinderance on that road toward our goals of man-kinds success! Charles Darwin Lives in Remote Places of the World—Green Jungles still Bring Forth New Animal Speices!!! Hip, Hip Hooray! There is hope for this World! 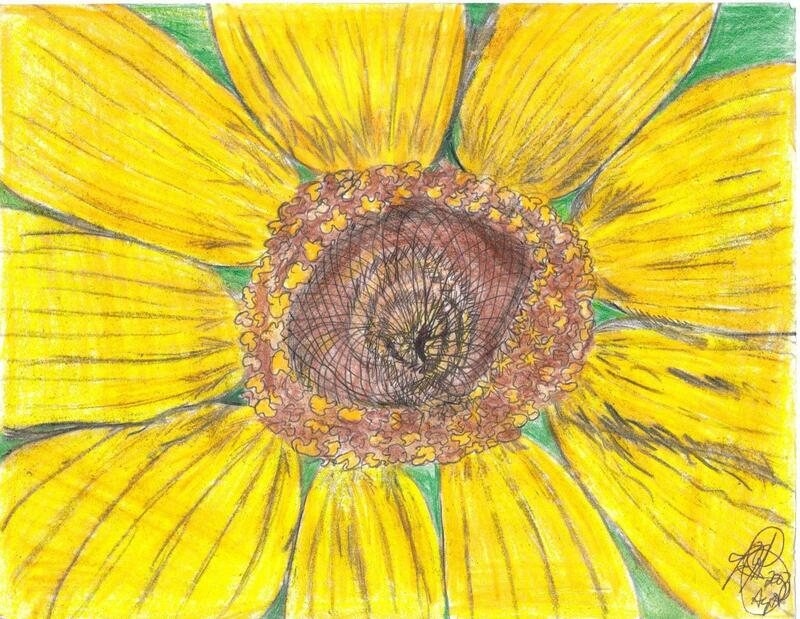 I drew this “Sunflower” with colored pencils during the summer. It was directly from a real photograph. I could not resist the natural contours of the flower petals. I hope I did it a tiny bit of justice. I am not as talented as some people….but I truly love nature and all of its wonders! Upon viewing the Black Voice Aol News blogs, I found one of my favorite interests! New Animal Species! —And Giant animals too! I love it! Take a look! And I am so happy that there are still people who love being a scientist. I do not always agree with the concepts and theories of all scientists…but I love it when they prove that certain animals will survive if untouched or bothered by the modern world. I hope this inspires you and big oil drilling, gold seeking, tree killing, coal mining, diamond, and precious stone mining, resource draining corporations of the fast paced global economy from ignoring the delicate balance of animal, plant, tree, and human kind on this beautiful earth. SAVE THE EARTH AND ITS INHABITANTS TODAY! Look at the simple beauty of even an oversize rat…. or pig-my possum, or the neon colored black and violet frog. How about the bird that looks like a beautiful suit form BARNEY’S THE MEN’S STORE, or Jones New-York. I do n0t care what you say!!!!! God has had the best FASHION SENSE, AND DESIGNER before man knew how to sew a piece of fur together to make a coat for the weather and build tee-pees! Animals are engineered without our help. Yes there are people doing bio-engineering….they are going to find out that their methods may do more harm then good in the long run. On that note…let me show you the beauties I found on that blog about the New Species! and Giant animals! Charles Darwin! Are you hearing this —where ever you are? I know some people would say my chubby little friend here is quite ugly….but really, he has a face his mommy probably loved! The “golden frog of Supata,” found in a remote region of Colombia, belongs to a group of poison dart frogs, which have toxins embedded in their skin. Scientist announced the discovery of the creature in August. There are also huge animals that need our protection. They are big but they do not carry harpons, knives or any weapons but what comes natural to them. It is up to us to maintain nature and the delicate balance between all creatures in the “circle of life” Look at these animals and realize….no matter how scary they may appear….they have no power over us. It is we, the humans that can control the life or death of these beautiful, raw natural creatures. They cannot jump up out of their natural habitat and start taking pictures of us! They can not research us and our existence. They cannot place us in boxes and cages and steal us away from our natural environment only to sell us on the black market. It is us who must take care of them. Let them live un touched by human hands as much as possible and uninterfered with so that nature takes it’s natural course so that these great and majestic creatures can live and die and keep this big old globe alive! Colossal Squid:In February, New Zealand fishermen grabbed this 990-pound monster in the Antarctic. It was 330 pounds heavier than the next biggest ever found. Echizen Jellyfish: In recent years, the giant beasts have disrupted fishing industry operations off Japan’s east coast. German Giants:Breeder Karl Szmolinsky, here in January, breeds rabbits like this one weighing more than 20 pounds at his farm in Eberswalde, Germany. Bubba the Lobster: The 23-pound crustacean came from waters off Nantucket, Mass., in March 2005. The Pittsburgh Zoo planned to take him, but he died. The following is an excerpt from the black voice Blog on Animals of the Lost world. During that trip, scientists took the first known photographs of Berlepsch’s six-wired bird of paradise, which was described by hunters in New Guinea in the 19th century. “Unearthing new species of mammals in the 21st century is considered very rare. The discoveries by a team of American and Indonesian scientists are being studied further to confirm their status. The animals were found in the Foja mountains rainforest in eastern Papua province in a June expedition, said U.S.-based Conservation International, which organized the trip along with the Indonesian Institute of Science. Please think of ways you can contribute to preserving the lives of these animals. Staying informed is one of the best ways. I have no money to donate….but I can blog about it and post these pictures that were taken to get the word out. All of this really involves mankind around the world….not just here in the United States. In March 2006, the Atelopus frog was found in the Nassau Mountains in eastern Suriname. It was one of 24 new species of wildlife discovered by scientists in the remote plateaus north of Brazil. Think forward, “PAY IT FORWARD”, and help keep this global community of humans and animals and fish moving forward toward life and the future, and not backward to extinction! FOOTBALL HAS GONE TO THE DOGGS!!!!! When I heard the Michael Vick story I got so disgusted, I said oh, no. What is wrong with this guy? He has the American Dream right in the palm of his hand! He has the opportunity others dream about! He has the chance to change the lives of young white, black, brown, yellow, children by starting foundations with some of that “hard cold Sports Cash!” What is this guy’s problem?! I have lived in neighborhoods where I had the ability to see young men between the ages of 14 and 25 walking around with thick bodied pit bulls on leash and some off leash. Those young men would stand in a group and talk while the dogs would sit or stand timidly beside the tough looking owner with the brand new unscratch sneakers and fitted caps, and puffy bomber jackets. These guys would scare me a little. To be honest, these guys scared me alot!!! You know why?! I am and always have been a lover of God’s creations! I love animals! When I was a young teenager I used to take the long ride out to Freeport Animals Shelter and volunteer. I grew up seeing my cat give birth. More recently I rushed my dog about five years ago to the Vet. when she gave a breach birth. The puppy had come out alright, but the mother and run from her own pain and the puppy popped out on to the floor. I got her and her new pupps to the vet. just to find out that everything was fine except for that little glitch! I helped a Saint Bernard that was wondering lost up and down my block before I was even twenty. The dog was sick and we did the best we could for it. My mother used to leave food in deserted car dumps when she would see a pregnant female or one that had appeared to have given birth recently. After she would gain the animals trust she would then put it in her car and take it home. My mother would get in touch with her friend Joyce. Joyce was well conected with animal assistance organizations. She would then get the “saved” dog free medical care, and free spay or neuter. After that my mother and Joyce would place ads in the newspapers to get the saved, healthy animal a home. So please understand, I never did, and do not currently have any one requesting me to write a blog about this Michael Vick issue, it is something that comes purely from the heart. Michael Vick is black. I must state the obvious! But Michael Vick’s actions do not equal the actions of all black sports players, or black people in general. All Michael Vick did was add to the climate of racial hostility! I have read the AOL blogs on the Michael Vick case and all I see is total anger and racial hostility and it is being wiped across the entire race of black American’s because of this”guy’s” horrible, evil actions. But should we who have been freed from that terrible life of slavery, now turn and enslave others….even if it is just a dog?! I do not understand the enjoyment of watching animals tear into each other. I had two dogs that were brothers. I midwifed them, and raised them. The two bothers loved to play fight. The two dogs would play and fight so hard I sometimes tried to stop them. My son would say, Mommy, leave them. They are just playing! I would watch and then the dogs would stop their rough play when one would yelp or they would just lean on each other, lick each other’s face and then lay down to an exhausted sleep. They loved each other and would not harm the other. The two dogs would even play rough with my son by jumping on him, licking him, and tugging at his clothes. If one dog jumped the fence the other dog would follow. They were inseparable! That is why that unnatural goal of dog fighting is evil. To turn two animals against each other, or train an animal to attack another animal on the grounds of “general purpose,” makes no sense at all. From my readings on the topic, and life experience tells me that dogs, or wolves, are pack animals. Generally dogs may show aggression for many different reasons. My question for Michael Vick , “Why are you using dogs for violence? What would make you believe that there was nothing else you could do to help your brother make an income for himself? Why would you hang, torture, and electrocute helpless animals? The dogs only had their teeth, and yet you had a brain. You were the more dangerous of the two living. This is a tradegy for Football!!! It made me wonder if Football is such a brutal sport that is messes up the mind of the Football player and how he preceives the world around him. Do Football players in general think or believe that no one cares for them and they have alot of pain from sports injuries so they do not care about the pain that they inflect on countless others in their personal lives? I would like an answer, that I know I will never get from Mr. Vick. I will share more of my personal feelings about animal rights tomorrow; and why it was unfare to have Michael Vick get an easy way to go on this one.. on this man who did not appreciate the opportunity handed to him. Why do I feel somehow responsible for his actions? Is it because I share the same “race” as Michael Vick ? I have read blog, for blog stating negative things about black people that sound like things from the sixties because of what Mr. Michael Vick has done to animals. I read in the Black Voices blog of AOL that the judge on the case for Mr. Vick is well known for his love and animals and is also known for his dislike of gambling! Look out Mr. Vick. I pray for the family of Mr. Vick. I pray that people in general take a reality check on how they treat animals. It scares me that we do not consider animals to have rights! Especially when this country has helped so many people to escape abuse on so many levels of inhumanity! Gotta go—I have a ThanksGiving Meal to cook!